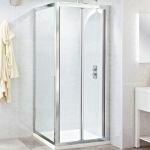 Perhaps the most popular and affordable design of shower door on the market is the bi fold, a tried and tested design. This is the workhorse shower door design, practical, affordable and durable. The inward opening split door design means the unit has a small footprint that doesn't impact on the rest of the bathroom. Bifold sizes range from 700-1200mm with adjustment to suit most alcoves. All of our models can be easily and cheaply made into a full cubicle with the addition of a side panel. Because bifolds are made up of a frame within a frame the glass in lower budget models tends to be specified thinner at 4 to 6mm. Our cheapest model the Ella Grace can be yours for as little as £140.99, while a high quality Mira branded offering can be purchased for under £400.00, both with lifetime guarantees.